Deciding between writing native apps or "cross platform" HTML5 apps is hard. It's an increasingly relevant debate as mobile and tablet usage continues to increase. Some people will only ever access your service and brand via a mobile phone or tablet device. 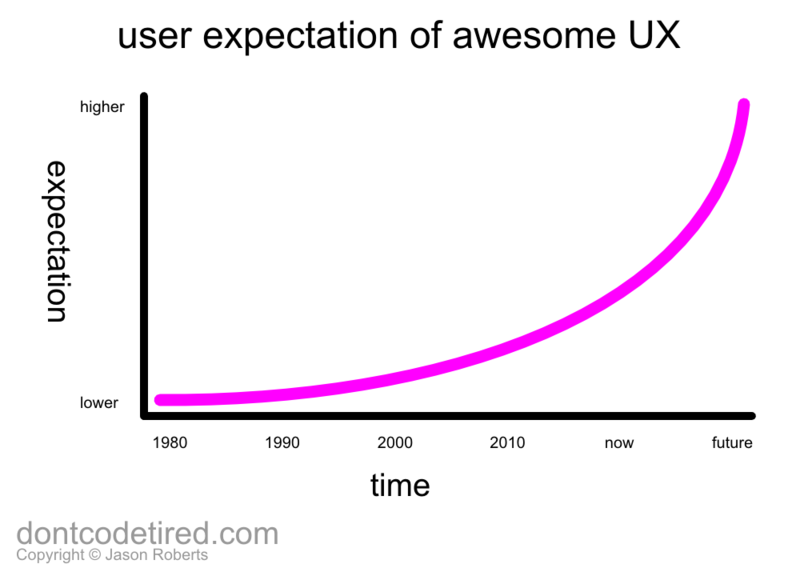 As the usage of mobile devices is increasing, so too is the user expectation of an awesome experience. 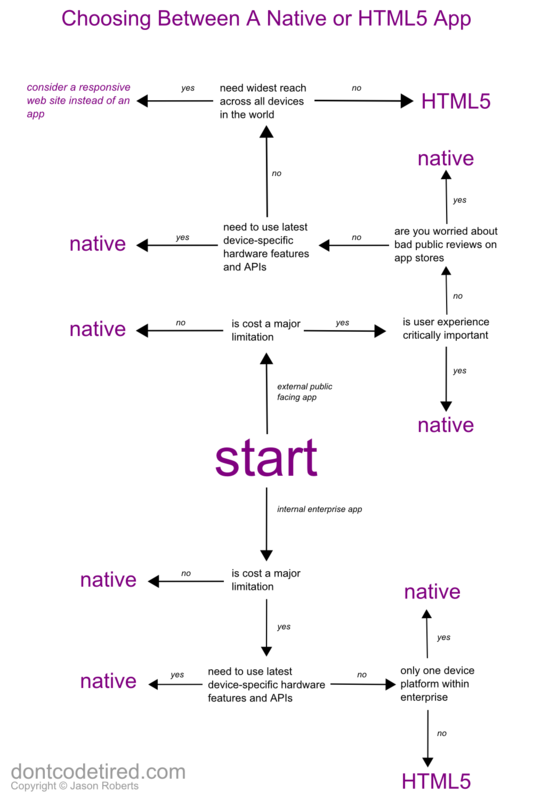 This flowchart, whilst not an extensive guide, is a good first step to become aware of some of the tradeoffs involved. Start in the centre and follow the arrows as best describes your situation. The pseudo-graphs in this section show the various tradeoffs and considerations that are relevant when choosing between native or HTML5 apps. For 'non-functional' content-based apps (such as newsreaders, etc.) where the app is a simple shell over web-based content; users may have a higher tolerance for a non-native feeling User Experience. 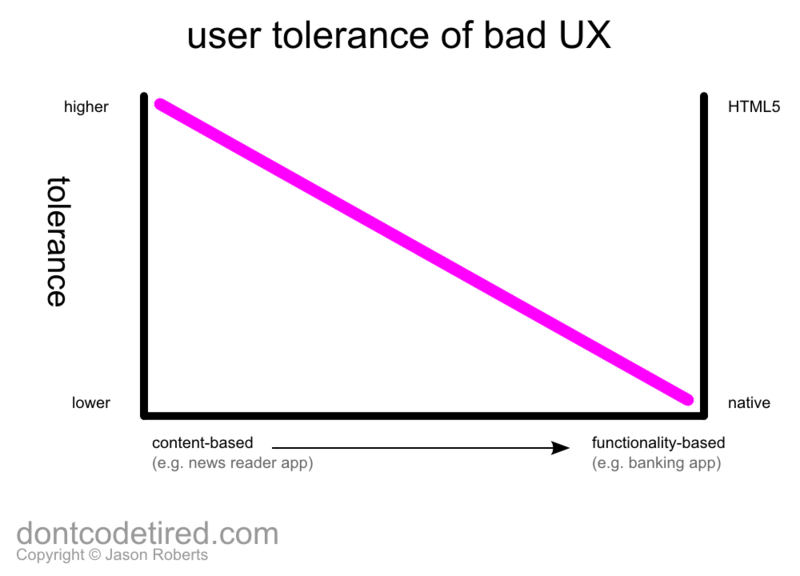 This graph shows how user tolerance for non-native feeling User Experience may change depending on whether the app is content-led or functionality-led. If we accept that a native User Interface is better that an HTML5 one, the question of code re-use to minimise cost becomes important. 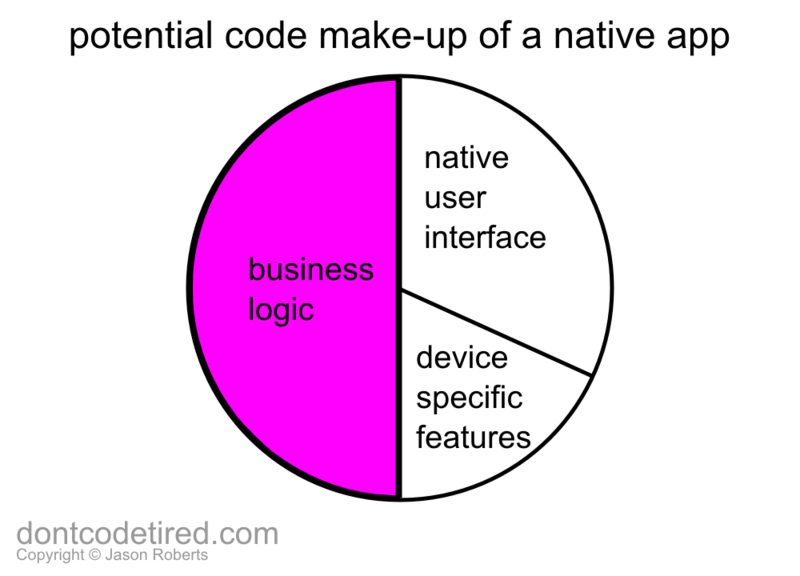 This pie-chart shows what a typical app may be composed of: native UI code, business logic and device-specific features. In this example, half of all the code in the app is business-logic related. This could be savings or premiums calculation code, statistical and reporting code, image manipulation, etc. If we want the app to be available on multiple devices and platforms, the question becomes how to not have to write the business logic multiple times in C#, Java, Objective-C, etc. Two options to achieve business-logic code re-use are: to use a shared cloud service or a code cross-compilation tool. In this approach, business-logic is moved out of the app(s) and into a cloud service. In this approach, business-logic code is written once and cross-compiled to native code for other platforms (e.g. using C# and Xamarin). A combination of the two approaches above can be used. 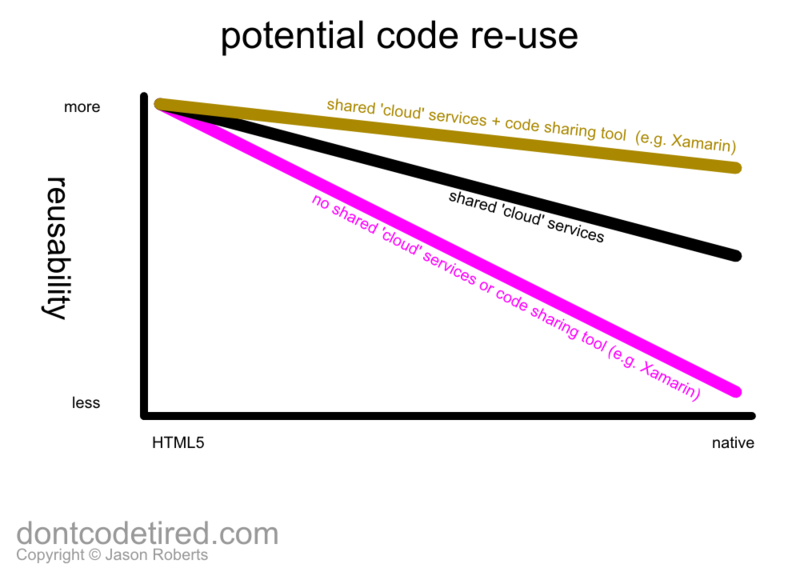 Lesser-used and non core functionality could be moved into a service whilst more often-used core functionality could use cross-compilation to native code. Functionality that needs to updated immediately across all apps (e.g. for legal reasons) can be moved into a cloud service. This article offers some aspects to be considered when choosing between native and HTML5 apps. As with all things, your specific circumstances will vary and may include other considerations such as regulatory, audit, legal or time-to-market restrictions. 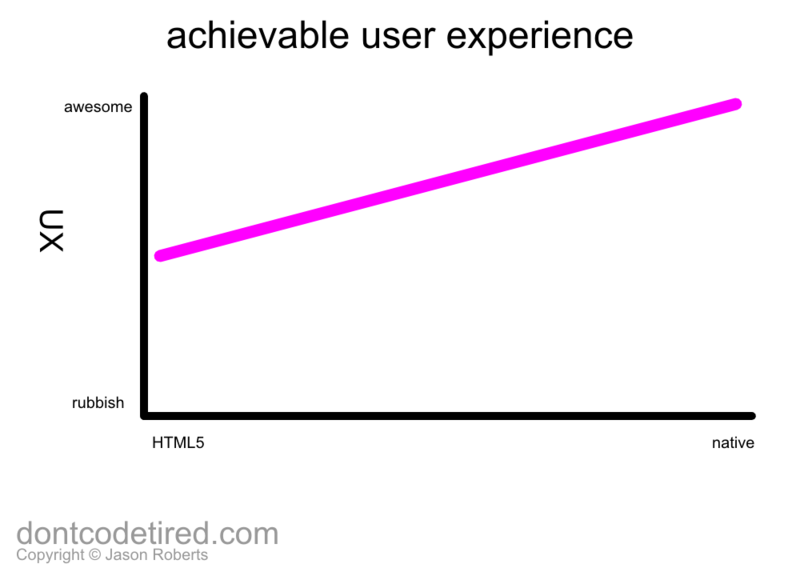 When deciding between native and HTML5 apps, the main axis of debate is likely to be cost versus User Experience. Authoring multiple native apps is likely to be more expensive than a 'single' HTML5 app, but some of the techniques described in this article may help reduce the costs. Unlike other channels (your web site, telephone support, stores, etc.) 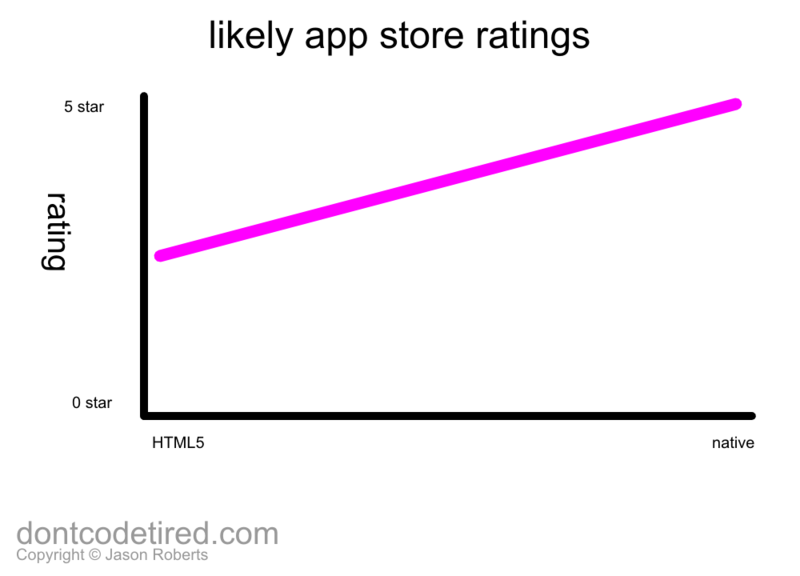 app stores allow your customers to write publicly visible ratings and criticisms. If you release a rubbish app (native or otherwise) you should be aware of any potential bad press and damage to your brand that may ensue. I think your points are good but the "final" decision diagram does not reflect them and is very very biased toward native. If this is so tricky to choose between native and HTML5, how is it possible that HTML5 is valid only in 2 circumstances and that these circumstance are the most difficult to reach ? 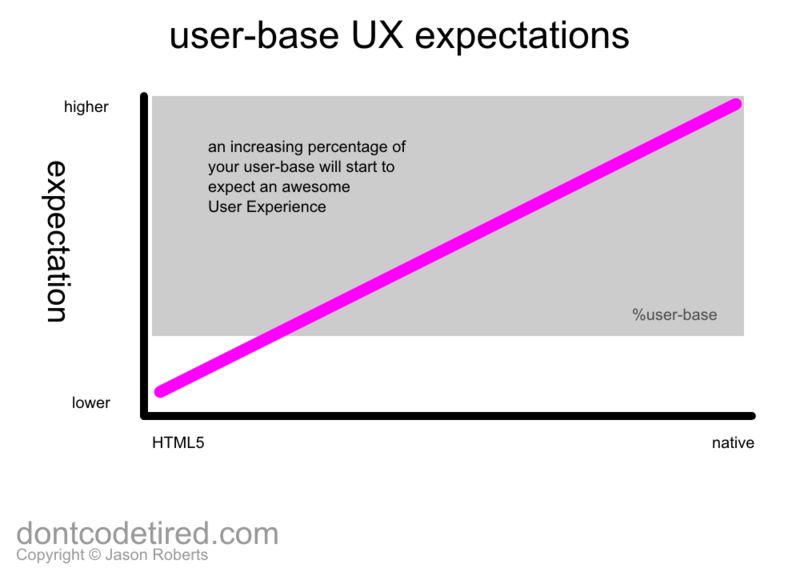 For example, how to say "no" to "is user experience critical" ? or no to "need goog public review" ? When you san HTML 5 App you mean apps accessed trough the browser only or you include apps which are installed trough the device App Store too? Presumably the HTML5 can only function with an internet connection and cannot store data to be uploaded later, i.e. if the app is used to carry out a process that requires several stages to be completed before uploading data, HTML can't handle it. @Nick: HTML5 apps have local storage and local DB. I believe this article is somehow outdated, while there is a lot of valid points. I believe this is due to platforms environment specifics. Totally agree here. I run an Android dev shop, so weigh my bias accordingly. 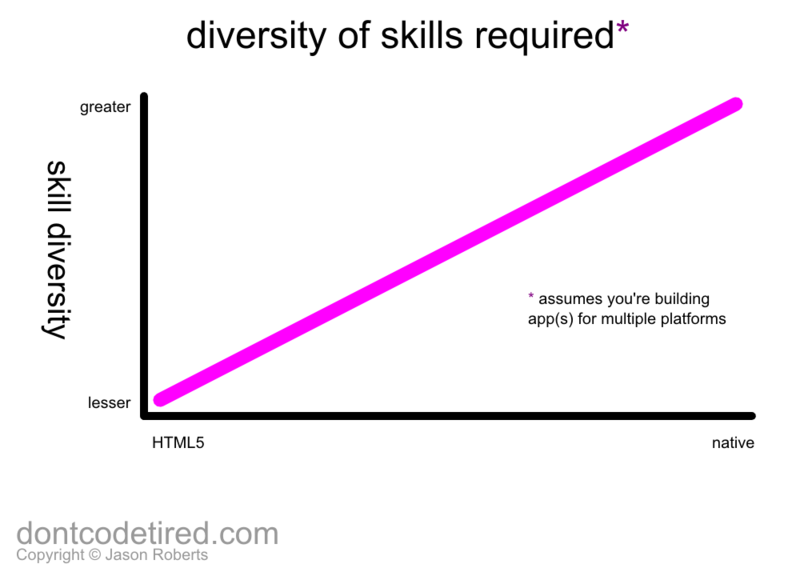 However, I come from heavy HTML and JS in the past. 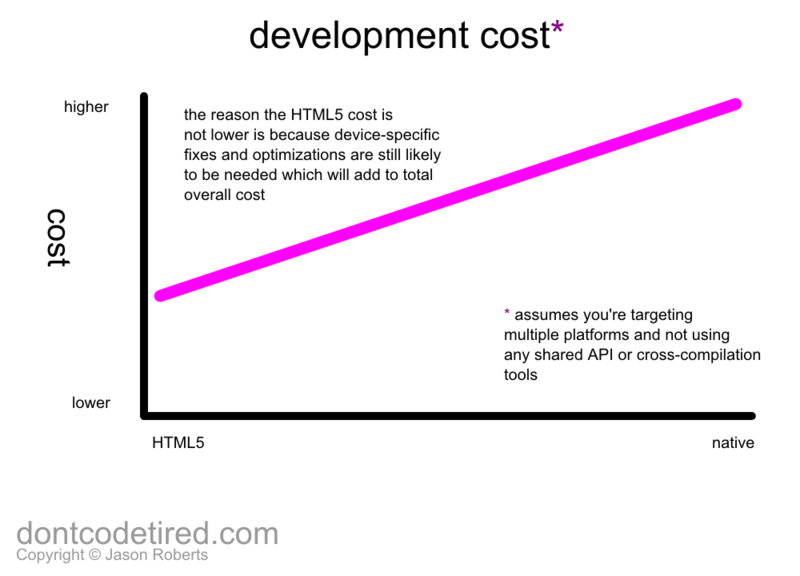 I would LOVE for HTML5 to be a viable platform, but neither Goog nor Apple really want that to happen, so it'll be a while. That's my conspiracy theory, anyway. Here's my rambling post defending that position. Lately I've been rethinking some of this. 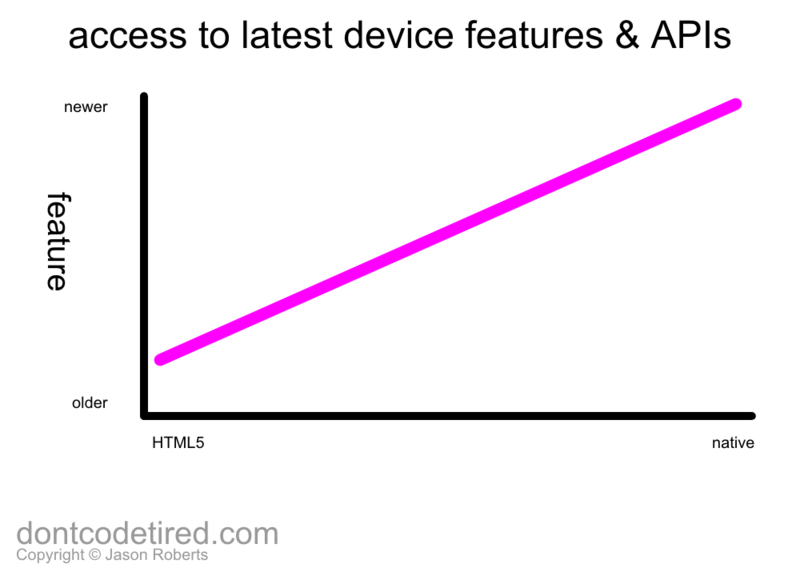 Not because I think HTML5 is turning a corner for public apps. We've been working with a new client that needs great UX on some apps, and could get away with "internal" functional apps for some other parts of their portfolio. Rather than trying to solve every problem, I think a highly functional HTML5 UI framework coupled with some rock-solid offline-ish support would go a long way. By "highly functional" I mean it works and is easy to build with. I do not mean it should try to appear native, and it could basically skip all the animation and fancy tricks. Make no effort to be a public facing app. Just solid controls that do exactly what they're supposed to do. If we get the time, I'm going to try to implement a phonegap plugin for sqlcipher, to allow encrypted databases, and implement a version of our offline sync tools. I think part of the problem with HTML5 is the people really pushing it probably come from a web background, and are trying to move that skill set directly over to mobile. Mobile is different. It just is. Trying to make an "app" that just talks to the cloud is basically asking for a crap experience. I tell people when they first get into mobile, don't think about it like you've always got a connection. Think of it like you almost always don't, and occasionally do. If your app doesn't immediately need a connection, yet stops working because you don't have one, you've pretty much failed. Cross platform business logic has been my white whale. It would be easy if platforms supported headless JS interpretation, but they don't, at least not without hacks. JS wouldn't be my first choice, but JS is awesome in the way English and VHS is/was awesome. Its everywhere. Mono is an interesting choice, but it adds a lot to the download package, and frankly, its hard to not think of it like its a Microsoft thing. Not that that's "bad", but its enough to keep a lid on adoption. I have seen demos of games written in Mono, though, and was pretty impressed. C++ is an option, but with the exception of one guy this past weekend, I haven't met anybody who thought that was the way to go. Rambling. Need to get back to the codez.